“By matching your car to a particular time, date and location, and then building a database of that information over time, law enforcement can learn where you work and live, what doctor you go to, which religious services you attend, and who your friends are,” the EFF warns. A 2014 ABC News investigation in Los Angeles found the technology broadly in use by everyone from the local police to repo men. The story notes that there are little or no restrictions on what private companies that collect time- and location-stamped license plate data can do with the information. As a result, they are selling it to insurers, banks, law enforcement and federal agencies. In Texas, the EFF highlights how state and local law enforcement agencies have free access to ALPR equipment and license plate data maintained by a private company called Vigilant Solutions. In exchange, police cruisers are retrofitted with credit-card machines so that law enforcement officers can take payments for delinquent fines and other charges on the spot — with a 25 percent processing fee tacked on that goes straight to Vigilant. In essence, the driver is paying Vigilant to provide the local cops with the technology used to identify and detain the driver. That’s right: Even if the contract between the state and Vigilant ends, the latter gets to keep all of the license plate data collected by the agency, and potentially sell or license the information to other governments or use it for other purposes. I wanted to write this story not because it’s particularly newsy, but because I was curious about a single event and ended up learning a great deal that I didn’t already know about how pervasive this technology has become. Yes, we need more transparency about what companies and governments are doing with information collected in public. But here’s the naked truth: None of us should harbor any illusions about maintaining the privacy of our location at any given moment — particularly in public spaces. As it happens, location privacy is a considerably expensive and difficult goal for most Americans to attain and maintain. Our mobile phones are constantly pinging cell towers, making it simple for mobile providers and law enforcement agencies to get a fix on your location within a few dozen meters. Obscuring the address of your residence is even harder. If you’ve ever had a mortgage on your home or secured utilities for your residence using your own name, chances are excellent that your name and address are in thousands of databases, and can be found with a free or inexpensive public records search online. Increasingly, location privacy is the exclusive purview of two groups of Americans: Those who are indigent and/or homeless and those who are wealthy. Only the well-off can afford the substantial costs and many petty inconveniences associated with separating one’s name from their address, vehicle, phone records and other modern niceties that make one easy to track and find. This entry was posted on Monday, September 5th, 2016 at 9:46 pm	and is filed under Other. You can follow any comments to this entry through the RSS 2.0 feed. Both comments and pings are currently closed. Back in and remember where you parked. That’s why I take a picture of the closest locator (5N) when I got on long trips. Backing in will only help in states that don’t require a front plate. I simply write that stall location on the ticket stub issued by the automated entry gate and put that into my briefcase, day planner or wallet, because those physical catchalls are always securely with me and that stub will be required for payment when I leave the lot. What I’m wondering is, why not allow plates to be covered when the vehicle is parked? Correct me if I’m wrong, but aren’t laws written such that plates only need to be uncovered while the vehicle is in motion? Last time I checked (which admittedly was a long time ago), in New York City, you were not permitted to park a car without license plates on the street and you couldn’t put a cover on a motorcycle parked on the street unless the cover left the license plate visible. The street is owned by the municipality and the state’s laws, as well as those of the municipality, govern what can or cannot be done. That is not the same for a parking garage, even if it is owned by a state agency. Um, no. Not only not a contributing factor but unrelated to both this story and the commentor’s linked article. LPR does much to enhance public security and safety. I am aware of child abductors quickly apprehended because of the the technology. I installed and maintain two LPR cams in front of my home after criminals committed several home invasions on the 1.75 mile stretch of road where I live. Perps immediately moved their activities elsewhere and were eventually apprehended. Neighbors were suspicious of the cameras at first but eventually came to appreciative the deterrent. There have been no further incidents. So, what if plate data is collected and sold and/or made available to law enforcement if it makes the world a safer place? Yeah! Let’s do away with those pesky fourth, fifth, and sixth amendments. They only hinder law enforcement. If you have nothing to hide, you have nothing to fear! Get out, you damned statist. Those who would give up liberty in exchange for temporary security will get and deserve neither. This is fairly common at many airports today. The other explanation I’ve heard is that it helps document vehicles stays when the user has lost their parking slips, so the garage can confirm the exact dates the user’s vehicle was in the garage. 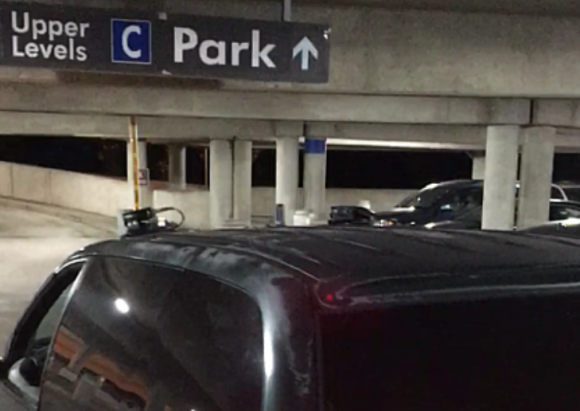 Before automation, the airport garage sent people around with clipboards to manually record the license plates each night, and those were manually entered into a computer system. So they’ve been doing it for decades one way or another. Not only is it used to determine how many days you’ve been in the parking lot (in case you lose your ticket), it is also used to prevent fraud. A common scam was to park for a week in the parking lot, then get a new ticket (trade, theft, an accomplice) and pay for just a few hours or a single day. I have had shuttle bus drivers offer to sell me a ticket with just one day on it. In Boston/Logan, they will follow up and fine you for this. There are many lawful things that are still unethical. You seem to justify this practice to help the handful of knuckle heads who can’t remember where they parked or have lost their ticket at the expense of 10’s of thousands of responsible people. Hey, you lose your ticket you pay the maximum. You don’t remember where you parked, you walk around a little longer (You won’t forget next time, believe me) Don’t penalize the rest of us for their mistakes! You also seem to justify the practice because they’ve been invading our privacy for a long time. Listen Roger, one guy with a clipboard is very different from a system that automates the practice at light speed and stores it in a database forever. As of 2013 Cars.com reports that there are 19 states that do not require front license plates on cars. When I read news reports about private companies gathering personal data on US citizens, I often think of that Rockford Files story. I recall the story included collusion between the private credit information gathering company and county elected officials. I believe it was the only story that was spread across two episodes. I think the purpose of the two part’er, was to create a spin-off that never occurred. It would be interesting to know how often people lose their cars. How expensive is it to have a vehicle roaming the garages 24/7 as opposed to a spare golf cart to assist the occasional citizen looking for their car? I remember back in the day when I worked for the police department – before computers and automated scanners, if we had some down time, we’d cruise through the hotel parking lots and run tags; quite often we’d have a stolen car, or a missing person…we’d also do the parking lots at hospitals, Wal-Marts, mall, etc……with ALPRs, we have one full timer who does that, it’s a lot more efficient and we’re able to bag a lot of people on warrants, etc…awesome technology! Yeah – LEOs here in South LA are constantly running out-of-state and paper plates. Catch a lot of stuff. It is. It’s what’s done–or what could be done–with the data that gives me pause. I’ve seen unmarked cars with readers going through the parking lots at work. Apparently our county has contracted with an ALPR vendor to locate the vehicles of people who are behind in the tax payments to the locality. Around 2012, when Physical Security was part of my IT Security job description, I saw this car driving around all the parking area of various offices taking license plates. I reported this to the police station and they said that this is a 3rd-party working for the local police. Thanks for contacting the EFF about this. We don’t realize how much these folks do for us. Isn’t it funny how the US Government can make being “homeless” sound so appealing? I know someone who works at a credit union, and they use this ALPR data when they are trying to find a car that is subject to reposession. Usually the people who are in this situation know that this is a possibility, and they go to lengths to hide the car to make it harder for the repo people to find the thing. They might swap cars with a buddy who lives across town, for example. The ALPR data helps give them an idea where to be looking for the car. They scan your plate when you park at Chicago O’Hare. If there’s *anything* (expired tags, parking tickets, etc..) you will find a ticket on your windshield when you come back. If it’s unpaid parking tickets the car will be booted – I experienced that when I parked at rental. Needless to say I won’t be driving a rental to O’Hare anytime soon. Our polite society still refrains from looking in at windows and behind doors, but it’s been Big Data for decades indeed. immune from data collection in theory. in power. Despite what Brian Krebs claims about the powerful being able to get rid of data on themselves, I can indeed look at the queen, and sometimes it’s laughably easy, even if many looks at the data of the powerful can take patience and money. its freedoms can be distorted. Fascinating article and research, thanks for sharing! I was surprised when I came to Spain (from Belgium and the Netherlands) to see parking entries with cameras that read your license plate before entering. This information is then printed onto the ticket. Enquiring about such practices from a privacy perspective (the Spanish transposition of the current EU Data Protection Directive, called LOPD, is the closest to the upcoming European General Data Protection Regulation), I was told that this was to avoid fraud. Spaniards apparently tend to “loose” their tickets and then claim they arrive like 2 hours ago… Some would call this a “picaresca”. In any case, I’ll enquire about the data ownership of such information, where my car was parked and where, as your article made me curious and wonder if the EU perspective aligns. Already this idea of public vs. private information is an interesting topic, certainly more so in the US as there is no expectation of Privacy in the public domain. Last but not least, your article reminded me that it’s the 2nd time I hear practical examples of Privacy for the rich as the FT wrote about it this week-end as well, see http://www.ft.com/cms/s/2/7a707048-648d-11e6-8310-ecf0bddad227.html. Up until now, it was always rather theoretical while this is actually already happening: no, Verizon should not make you pay more or less for ads or no ads, net neutrality, etc. etc. If anything, I suddenly realise Privacy is becoming a luxury… what? right? privilege? at least something that is becoming ever more valuable and I should cherish/defend, for me and my loved ones. I don’t think one has to be ‘rich’ to either opt-out of all these people search databases; either do it yourself or pay a nominal fee to a privacy company to do it for you. Obviously that won’t stop the government or professional hackers but does make it difficult for the casual snoop. I know a tow operator in western NY who gets most of his business from the new york state police who have a couple of cars similarly equipped. They cruise the malls, walmart, etc. Their system is linked to the DMV and it automatically give the officer an alert as he cruises the parking rows including a pix of the car he passed. I guess it alerts on the registered owner having a warrant, etc. If we drive past each other on the highway and you note my car and plate details, you’re being observant. But if you (as a private citizen) put cameras all over my neighborhood and used collected data to figure out where I lived, worked and bought my groceries, it would not seem unreasonable to consider you a stalker. One of the principles that we need to adhere to if we wish to retain a semblance of a just society is the idea that our law enforcement agents must respect and obey the law even whilst they go about ensuring that we do the same. This is why you should never see a Highway Patrol Officer speeding unless there is a crime in progress. So now the question becomes whether or not mass surveillance of any kind is tantamount to widespread stalking. A proponent of big data surveillance will likely argue that it only amounts to stalking if a user access the data library to look at your activities without the authority to investigate an active felony of which you are suspected. But how do you monitor and enforce that when the data is held by a private company? What if the private company performing the collection hands it off to a different company for analysis? And perhaps most relevant of all: given the fact that 99% of the data collected can only be relevant *after* a crime is committed, how does the time, money and effort being invested in these implicitly follow-up, post-crime activities help with crime *prevention*? I agree with you in principle, but that ship has sailed, I’m afraid. At least in this country. Boston has done this for at least 8 years. They even print your parking location on the receipt when you pay, using this information. I wonder if it is legal to “blind” these ALPR systems by emitting an unseen by humans, high power IR LED around your license plate? Most of the camera are infrared sensitive and it would be like someone shining a flashlight onto your eyes and asking you to identify them. But it would make you look suspicious and you couldn’t leave the IR running after being parked. I got the idea from an online picture of a baseball cap that has IR LEDs under the brim which basically masks the user on CCTV cameras. Just take the plates off when parked and throw them in your trunk. You can devise a quick connect/disconnect system to make it easier to stow them. a ma jig or where you can acquire free of charge delivery to the nerf stampede ecs-50. Despite its size, it’s quite simple to handle and also the darts shoot out at impressively long distances. Despite being made with the larger DSi XL, the Ultimate Travel Case isn’t too bulky.